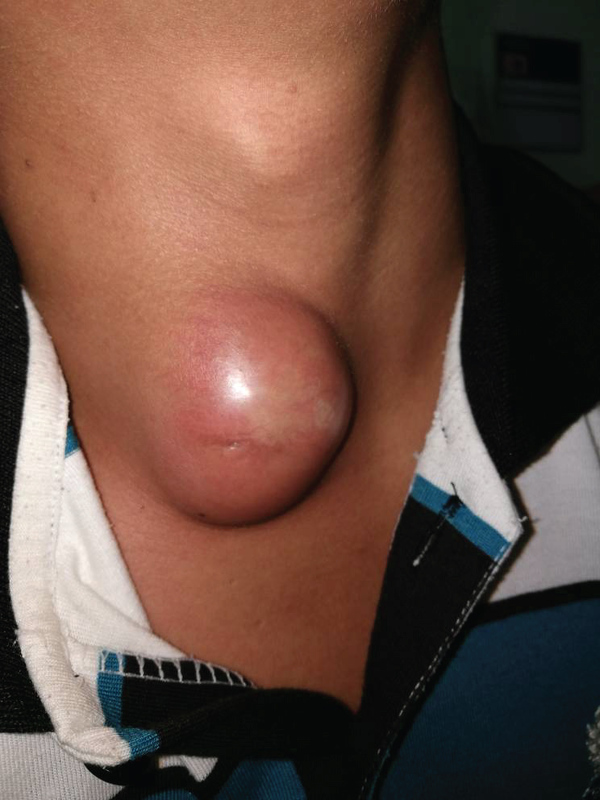 A 25-year-old gentleman presented with recurrent right lower neck swelling for 2 years. The recurrent attack of infections were always precipitated by upper respiratory tract infection. On clinical examination, there was a cystic swelling located at right lower neck, and anterior to sternocleidomastoid muscle. It measured 5 cm by 5 cm in diameter, with a sinus opening (Figure 1). Computed Tomography fistulogram of the neck showed similar findings that was suggestive of branchial cleft cyst without fistula seen. 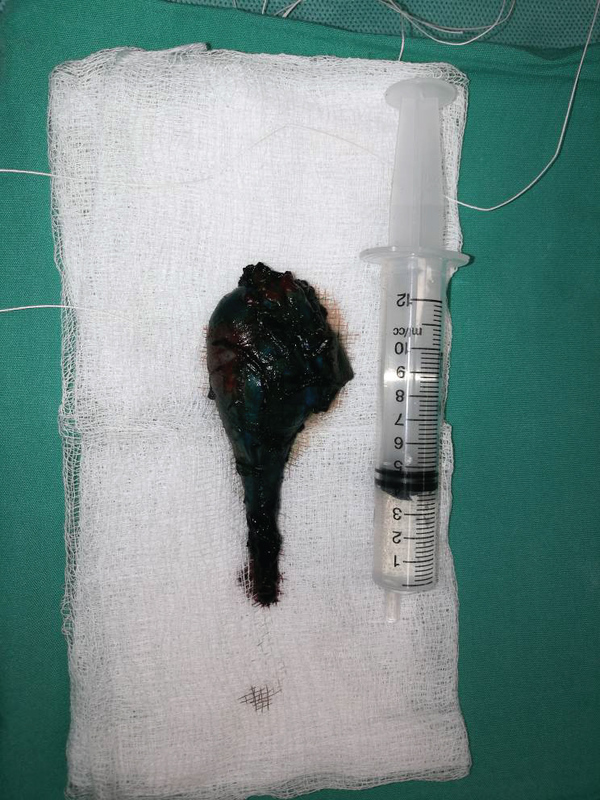 He underwent surgical excision with intralesional injection of methylene blue via the sinus opening. This technique is adopted to help define the extent of the cyst because identification of complete cyst wall was challenging due to fibrosis from recurrent infections. Total 5 mls of dye was injected and excision was performed via step ladder technique. The cyst was removed completely (Figure 2). 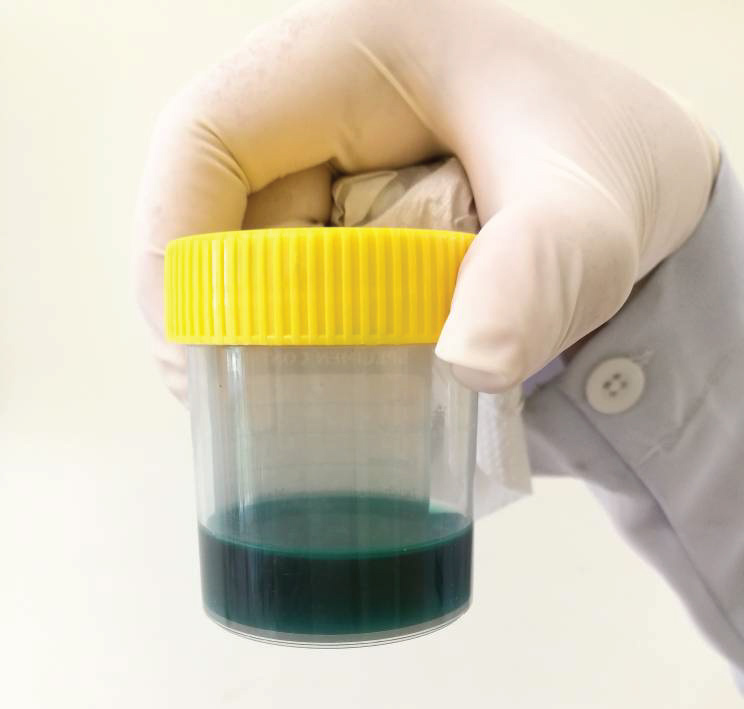 At about 6 hours postoperatively, she started passing out blue-coloured urine (Figure 3) associated with nausea and vomiting. She was managed conservatively with adequate intravenous hydration and monitored closely for neurotoxicity. Her urine returned to normal after 24 hours and was asymptomatic. Methylene blue is commonly used in surgical fields to help identify targeted organs or structures. 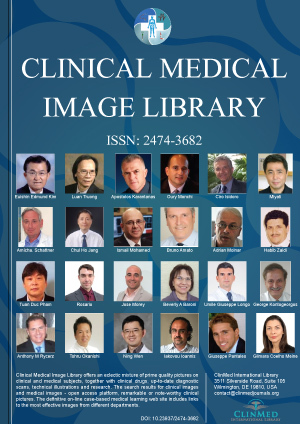 In the case of branchial cleft anomalies, it is a good tool to define the extent of the swelling to ease surgery and achieve complete excision particularly in the background of recurrent infections. Methylene blue is filtered via kidney. Despite its rarity, adverse effects such as neurotoxicity and cardiac toxicity may still occur. Figure 1: 5 cm by 5 cm in diameter, with a sinus opening. Lorna Ting, Otorhinolaryngology Department, Queen Elizabeth Hospital, Kota Kinabalu Sabah, Malaysia. © 2018 Ting L, et al. This is an open-access content distributed under the terms of the Creative Commons Attribution License, which permits unrestricted use, distribution, and reproduction in any medium, provided the original author and source are credited.